The perfect, I mean perfect, weight for all seasons. Not heavy, but warm enough for our drafty 110 year old farmhouse. This luxurious down comforter is a plush option for sprucing up your bedroom. The Elle pinstripe comforter is made of microfiber fabric and stuffed with fill in a baffle-box design. Its fill power of 600 and all-season warmth makes it the perfect comforter for your bed year round. Down and feather-filled products are packaged tightly during shipping. Upon receipt, remove this item from its packaging, fluffgently, and allow several hours for full loft recovery. In addition, products sealed in plastic packaging sometimes have a disagreeable scent because of concentrated natural fibers. A fewhours of airing typically removes the odor. We recommend that this item is fluffed at least once a week tomaintain down distribution. The digital images we display have the most accurate color possible. However, due to differences in computer monitors, wecannot be responsible for variations in color between the actual product and your screen. Looks cheap, keeps you warm. The microfiber feels super cheap, the "pinstripe" is barely visible, and if I saw this in a store I wouldn't have purchased it. Holding it up to the light it appears someone took about 2 cups of down and stretched it out 2 feathers at a time to fill the comforter. I was going to return it but decided to try it and surprisingly enough, it kept my husband and me warm, so we're keeping it. If you like the feel of a heavy comforter, this is not for you. If you want something that you'll cover up with a duvet and is very thin, go for it. Elle Microfiber Down Comforter is neither to warm or to cumbersome very comfortable. I love, love, love this comforter!!! It's exactly what I was looking for. Not too hot and just warm enough. Wonderful to wrap up in. And the price was fantastic! Very lovely item and suits me fine as I tend to run warm. But if you are searching for a big fluffy thick down comforter, look elsewhere. Nice item for the price! And I do feel it will be a year-round item for me. THIS IS THE PERFECT DOWN COMFORTER. IT FIT INSIDE MY DUVET COVER JUST RIGHT AND IT SLEEPS SUPER COMFORTABLE. I PURCHASED A SECOND ONE FOR USE IN ANOTHER ROOM. HIGHLY RECOMMEND A PURCHASE FOR ANYONE IN THE SOUTH...IT IS PERFECT ALL YEAR LONG!!! A bit flat, but warm. No ties on corner. This comforter is a bit flatter in real life than in the photos, even after shaking it out each time. I was a bit dissapointed by that. I even bought the king size to fit in my queen duvet cover hoping for a bit of extra fullness, but it's not as puffy as I wanted. It's still very warm and I haven't noticed any shedding, so I am happy with it, just keep that in mind if you are hoping for a big full comforter. Also, there are NO ties or grommets on the corners, which is also a bummer. I don't know why they even make them without ties anymore! It should be a standard feature. LOVE this comforter! Did you know that down adjusts to your body temperature if you don't have it weighed down with more blankets on top? I can use this year round and with fibromyalgia, it's perfect. It warmth seems more penetrating than that from blankets, and eases my aches and pains without felling weighed down! I recommend that you try it as well! I bought 2 of these comforters, with duvet covers for Christmas. My son and I found that we can not use them. We both found that the comforters make us sweat. I have found that I can use mine, without the duvet cover, if I have my room quite cold. I originally chose these comforters because it listed the origin of the comforter as the U.S.A.. Ends up, assembled in the U.S. of Chinese components. Very disappointed. Great comforter. It is perfect for your everyday use. I have it my guest room and my guests always comment on it. Washes up well without any issues. I really like this comforter for spring and fall. It does have feathers escape from time to time. For winter it is not heavy enough and it is to heavy for our cool summer nights. With comforters always use a duvet cover to avoid having to laundry at the frequency you would a blanket or quilt. Light weight but warm. After first wash down shifted within boxes and not easy to re-fluff. Great comforter. Soft and cozy. Love them! will be purchasing more as I replace the duvets throughout our home. Perfect for my vacation rental! "Does this have tabs to tie into a duvet cover?" Hello katyb, thank you for your inquiry. Unfortunately, the information you have requested is currently unavailable. You will receive an email notification once an answer is posted. Have a great day. "Are fire retardant chemicals used in this product? and where was it made in? thanks." Hello liz, there are no fire retardant chemicals used in the product. This is made in the USA. Please let us know if you have any further questions. "How flat is this comforter? Does it fluff up a lot ?" Hello Sky91002, the comforter rather flat but may fluff up. Thank you for shopping with us! "What is the Thread count? 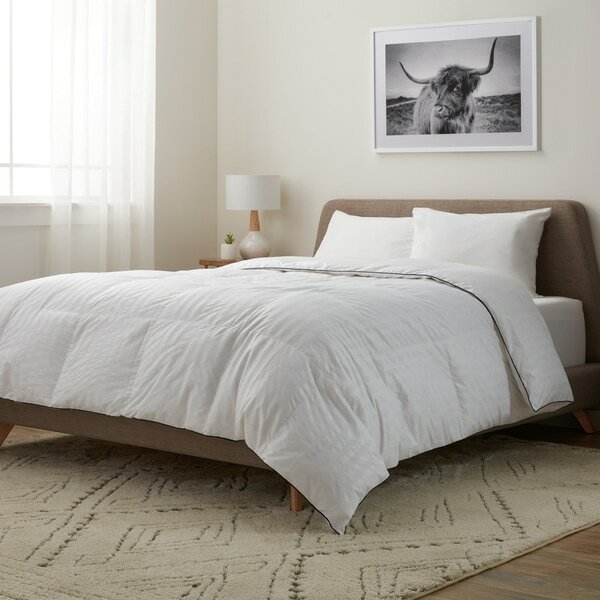 Is this a good comfortable (soft & fluffy) quality comforter? Does it shed? Is it on the Thin side?" Hello Girl38114, we don’t have a thread count for Microfiber fabric, we can provide the GSM for this fabric which is 104. This is a good, soft and fluffy comforter that does not shed. It has a fill power of 600 and is a good all season comforter. Thank you for shopping with us. "What company supplies the down, and was the down from live-plucked ducks?" Hello Kayla, thank you for your inquiry. Unfortunately, the information you have requested is currently unavailable. You will receive an email notification once an answer is posted. Have a great day. Needed a twin size down comforter for the upcoming winter. "Is this duck or goose down?" Hello Karen, the fill is white down, which is primarily duck. Thank you for shopping with us!